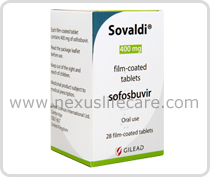 Sovaldi Tablets is a hepatitis C virus (HCV) nucleotide analog NS5B polymerase inhibitor indicated for the treatment of chronic hepatitis C (CHC) infection as a component of a combination antiviral treatment regimen. Storage And Handling:- Sovaldi Tablets are yellow, capsule-shaped, film-coated tablets containing 400 mg sofosbuvir debossed with "GSI" on one side and "7977" on the other side. Each bottle contains 28 tablets (NDC 61958-1501-1), a silica gel desiccant, polyester coil and is closed with a child-resistant closure.